As some of you know last year was a trying time for my family and I. One day I hope to truly go into depth about the things that happened. However, one thing has remained constant in my life….and that is the healing power of Storytelling and Art. I am working on a series of Whimsical Illustrations, poems, flash fiction, and short stories to share with you all soon. But let me leave this illustration and poem with you….. I see Love Mojo peering at the sun with one roller skate looking for her mate. I see a bright eyed woman contemplating whether she will blow a trumpet that makes sounds with bubbles. A robot with donut eyes staring at a freshly baked cake in the window. An underwater princess making a call on the starfish network to see if anyone else can see the love cloud sending a message through the turbulent waters above. A unicorn snail heading for the beach praying that his dream of riding on a sailboat comes true. I see a flower spirit standing up for the rights of her sistren. In the middle a clown oracle sends a letter with express priority to tell all the beings about the royal proclamation. During my Featured Show at Columbia City Gallery I was given an opportunity to expound on my work. After I reviewed it I have gotten to a place where I am wondering what inspires all of us? What inspires you? Thank you Eliaichi Kimaro for this beautiful video! Where does my inspiration come from? Earlier this week I recorded an Artist Talk for my Featured show "Beads, Birds, and Blue" at Columbia City Gallery. It was really amazing to talk more in depth about my work with other Artist's as well as people who my work really resonated with. This Featured show was one that came about from the same place that all of my inspiration comes from and that is through dream work and meditation. I have six pieces on view at the Gallery and they all represent a part of my unfolding and allowing Spirit to really come through my work. One of my main inspirations were the prayer bowls my Ancestors prayed into when they were enslaved so as not to be heard. A read through of the slave narratives gives first-hand accounts of this practice. I pay homage to this practice with two prayer bowls. One entitled "Catching Prayers" and the other "Calling on the River". Both of these prayer bowls were my interpretation of the slave narratives as well as a book I found on my Paternal/Ancestral line that comes from Ridgeway, VA, and Martinsville, VA area. 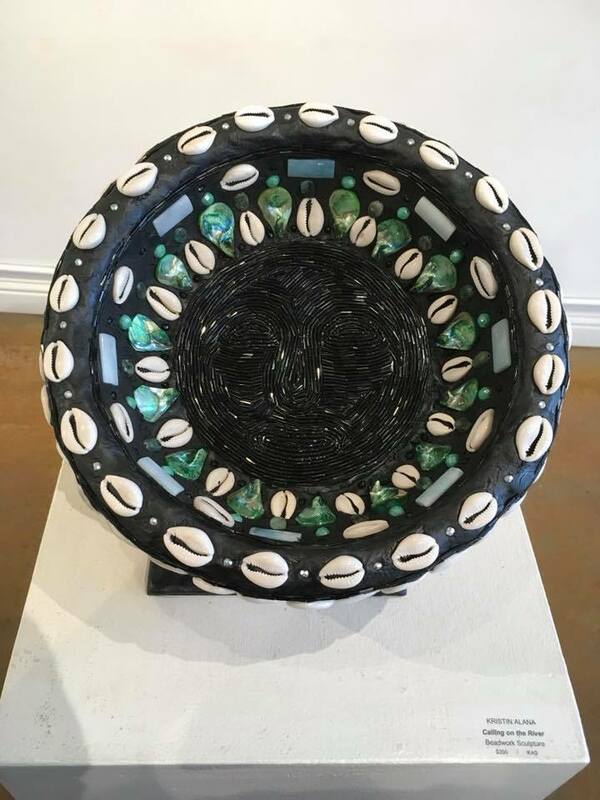 The book is called "The Hairston's: An American Family in Black and White"
During my Artist talk, I mentioned how I believe that my Ancestors were not just praying in the pots as a Christian form of worship, but also as a way to still incorporate veneration to their Ancestral deities as well. Given that they sometimes they went into the forest to pray with iron kettles and cooking pots it made me think of Ogun a West African Orisha who has a connection with iron and the forest. It was an artistic hunch that I had to follow. Why do I go into all of this detail? Well, because simply it is where my inspiration comes from. My connection to my Ancestors. My intention is to write more about my work on my blog as well as write more about African-American connections to beads and beadwork. More to come. Lately I have been obsessed with brooches. I have begun work on a new one. Copper seed beads make up her face, and Black bugle beads make up her crown of hair. Still stitching to bring this one together. All I have left to do is edging and backing. Today, I finally sent over my final edits for the parable story "Cerulean and the Snake"
The story means a lot to me, as it speaks to us remembering our magick. Cerulean and the Snake is a story about a little girl named Cerulean who grows up in tune with her inner magic. She can speak to the trees, flowers, animals and the lake and they tell her stories. When her gifts threaten to make her an outcast, she meets a friend who helps her honor the integrity of her intuition. This is a story for girls of all ages, about bravely showing up authentically, and it is an encouraging tale for anyone who dares to honor that still small voice within. This story was divinely inspired through Kristin Alana a visionary artist and sacred storyteller. Stay tuned for the release. How can you start off a blog? It's the same as starting off a creative project in my opinion. You know staring at a blank canvas, page or project. You really don't know where to begin sometimes. So it's best to just dive right in. My first few posts will talk about some of my past so that you can learn more about who I am as a creatress. My first Job was a rather unusual one but it started me down the path of training my creative abilities. When I was about ten my mother opened a flower shop up in my father's memory. My father passed away when I was nine and his dream was to be an entrepreneur. The flower shop was the perfect opportunity my mom felt to honor my father and to express her creative skills, all while starting a family business. Oh my goodness, how I used to resent going their every day after school. I should mention at this point that it was located inside of a funeral home. After school hang-outs for me included walking home from flag squad practice and helping my mother prepare casket sprays. At about seventh/eight grade I started helping out in the chapel that was there too, I would pass out programs for viewings. It was really an interesting experience. As a child, I would see the bodies inside of the caskets and we would beautify them caskets with the flower arrangements and floral sprays. Sometimes when we were locking up at night I would say prayers for the deceased and sing a spiritual. In my mind I worried that they would be in the building all alone. Looking back on this period of my life, I realize this was the ground from which I started to develop my connection to Spirit. At that time in my life I had just lost my father, and felt enraptured with grief. I looked for hope, but had daily reminders of people transitioning, but it was juxtaposed against making beautiful things. I started searching for the Divine and learning the ways of flowers, the meanings, purpose and message behind flowers. I always had a strong connection to Spirit from my early childhood, but my lessons on beauty/rebirth and cycles was really learned first hand working alongside my mother. BTW: We made floral arrangements for other occasions too, like weddings, holidays and proms. So it wasn't all morbid working in our family flower shop. Eventually my mother branched out and had another location, where we learned event design and created more elaborate floral works for events in our community. I am so thankful to my mother for being my first teacher in creating art. The medium was flowers but the practice of making beautiful things every day, has stuck with me, and I make it my mission to create things every day because of it. Thank you for reading and supporting my work.